The history of Sawayama Castle is long, and is said to have begun in the early days of the Kamakura Period (1185-1333), with the construction of a building on the side of Mount Sawayama by Tokitsuna, the sixth son of Sadatsuna Sasaki, an Omi warlord and descendant of the Emperor through the Minamoto family. The Sasaki clan, however, was thereafter split into two opposing factions: the Kyogoku clan to the north of Lake Biwa, and the Rokkaku clan to the south. Sawayama Castle lay at the border of their spheres of influence, and the two clans continued a cycle of attacks and retreats there. With the opening of the so-called Warring States Period (1467-1603), the area to the north of Lake Biwa was seized from the Kyogoku clan by another clan, the Azai, who established hegeomy in the region, beginning a struggle for control of Sawayama Castle, which lay between the territory of the Azai and the Rokkaku clan to the south. Even during the 16th century, during the time of great warlords Oda Nobunaga and Toyotomi Hideyoshi, Sawayama Castle was considered extremely important for its strategic location in the defense of Omi Province. Nobunaga placed his chief vassal Nagahide Niwa in command of Sawayama Castle, and Nobunaga himself used the castle as his base to secure power over Omi. During the rule of Hideyoshi, Sawayama Castle's position of importance remained unchanged through the successive command of generals Hidemasa Hori, Yoshiharu Horio, and the chief of Hideyoshi's five commissioners, Mitsunari Ishida. Sawayama Castle was gradually developed, and once Mitsunari Ishida became lord of Sawayama Castle in 1590, a five-story keep was constructed, and the castle's main gate faced the Toriimoto district of Hikone. Additionally, during Mitsunari's time, beneath the castle's inner citadel, its outer citadel (ni-no-maru), outermost bailey, drum tower, and "Lotus Tower," and more stood connected along the mountaintop. At the foot of the mountain, the castle gate opened out towards the Tosando Road, and in the space between the two castle moats, plans had been made to construct a castle town including residences for samurai, foot soldiers, townspeople, and more. Later, the castle saw defeat during the Battle of Sekigahara, and was abandoned when plans were made to construct the new Hikone Castle. During this construction period, much of Sawayama Castle's stone walls and buildings were carried away for use in Hikone Castle. At present, the only indication of this old history is a sign reading "The Site of Sawayama Castle." 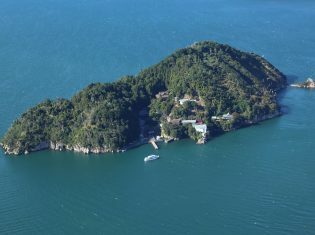 There is also a hiking course that leads to the summit of Mount Sawayama, from which hikers see a panoramic view that includes Hikone Castle and Lake Biwa. 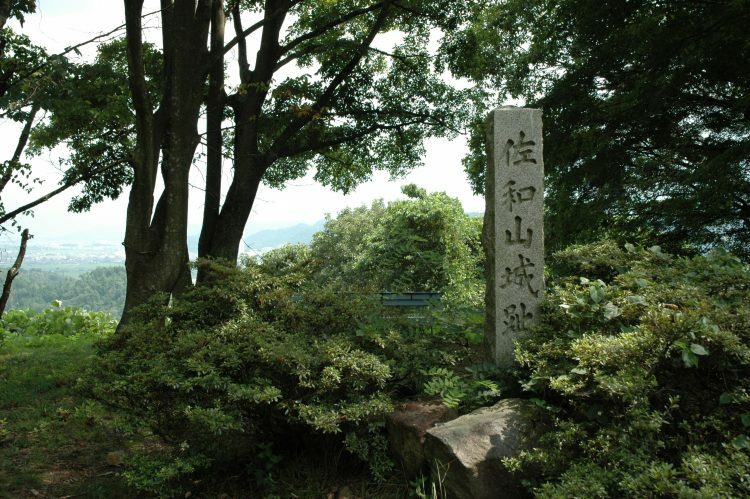 The former site of Sawayama Castle is located on a mountain whose lands also belong to Seiryo-ji and Ryotan-ji Temples. Please refrain from any use of fire on the mountainside. We ask for your cooperation in protecting this valuable cultural site by taking home any trash you bring, etc.